Sir Elton John has added a show for Melbourne on his upcoming Australian tour. Former Bad English and The Babys frontman John Waite is heading to Australia for the very first time. Former Talking Heads frontman David Byrne will head to Tasmania to headline the Mona Foma Festival in Hobart in January. Less than ten days out from their Australian tour, LA electro hip-hop crew Far East Movement cancel. 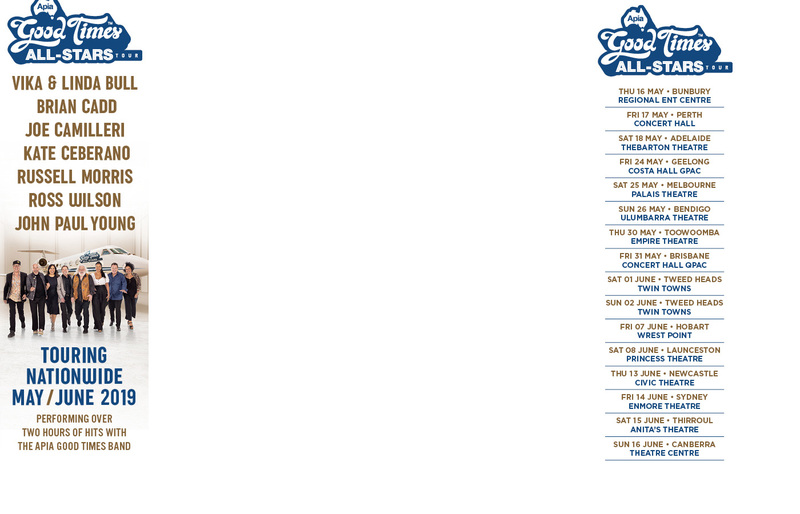 The premier Morrissey fansite has posted up three New Zealand and Australian tourdates for the dour one. Nu-metal gods Linkin Park book two huge side shows with Stone Sour to accompany their Soundwave sets. St. Jerome’s Laneway Fest has plugged in the dates for next year’s indie extravaganza and hinted at the line-up. Irish pop-rockers The Script will appear in Sydney for a single show later in the month. Idol ocker Shannon Noll has augmented his 40-date national tour with another eight shows. Scuzzy Melbourne post-punk trio Damn Terran air the first taste of their debut album produced by Regurgitator's Ben Ely. After three sold-out tours of Australia, R&B legends Boyz II Men return in November. A host of stars join forces to pay tribute to the life of late Australian pop star, actor and TV host Darryl Cotton. Brisbane’s Sprung Festival has announced it will extend the evening with an after-party featuring M Phazes and Mantra. Jeff Martin has announced a mammoth national solo tour following the successful Tea Party reunion. Ed Sheeran was joined onstage by Gary Lightbody for a special performance of Snow Patrol's 'Chasing Cars' at the iTunes festival at London's Roundhouse venue last night (02.09.12). Harlem tenor Noah Stewart and The Voice finalist Rachael Leahcar have been chosen as the first performers for the very first Yellow Lounge in Sydney. Yon from Tripod has put together his first ever-solo show Mandaddy. It is on now at Chapel On Chapel in Melbourne. Dwight Yoakam will return to Australia for an East Coast tour in November. La Toya and Paris Jackson celebrated Michael Jackson's birthday by partying with an impersonator of the late singer, during celebrations in his hometown of Gary, Indiana. The Beach Boys have reached Australia on their 50th Anniversary tour and last night (August 31, 2012) played three hours of music history for fans for the first time with founder Brian Wilson in decades. The late, great Billy Thorpe may appear as a hologram on the upcoming Long Way To The Top shows. The 2012 Meredith Music Festival has completely sold out, faster than any other time in its 22-year history. The first ever Refused show for Melbourne sold out in four minutes this morning. New Orleans’ EYEHATEGOD will perform at the inaugural CherryFest in Melbourne in November. Zoran Trivic, guitarist for Perth band Gyroscope, is expected to make a full recovery as he mends from serious injuries from a motorcycle accident four months ago. The Beach Boys performed 50 songs on the first night of their Australian tour in Brisbane on Tuesday night. Late on Tuesday, Duran Duran announced that they would be cancelling all of the remaining dates on their world tour due to the illness of Nick Rhodes. Madonna is opening the North American portion of her MDNA tour tonight in Philadelphia at the Wells Fargo Center. She'll finish up on November 20 in Miami before going to Mexico City for two shows. Primal Scream have announced their Australian sideshows when they tour for Meredith. A restless crowd gathered at Rod Laver Arena on Monday night (August 27, 2012) to catch a glimpse of Mr Worldwide and the star studded line up that joined him on his world tour “Planet Pit 2012” which included Taio Cruz and Australia’s own, Timomatic and Havana Brown.